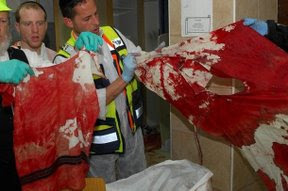 Are Jews for Obama in denial about building the framework for their own destruction? Is this evidence of American Jews' failure to learn the lesson of "We're Germans first?" Infidel Blogger Alliance combines Jerusalem-based founder of Jewish Media Resources, Jonathan Rosenblum's well-reasoned editorial from with Memri TV's revelation from Palestinian Television of Islamists' preaching Muslims' obligation (and intention) to destroy) Jews everywhere. "American Jews who are voting for Obama don't realize it, but they are voting against Israel as their state of asylum in case of another outbreak of anti-Semitism." "The Jews were sentenced to annihilation, before even a single Jew existed on the face of the earth." - Palestinian cleric, Muhsen Abu 'Ita. Infidel Bloggers adds 'American Islamist group Sabeel's Naim Ateek professes the Palestinian Authority to be a "liberation" movement.' Apparently, that must refer to the liberation of Jews from this world. Rashid Khalidi was known to be affiliated with, and protected by Arafat’s Fatah. A 1979 New York Times report (by Youssef Ibrahim) described Khalidi as “a professor of political science who is close to Al Fatah.” In Beirut, to be “close” to an organization meant you enjoyed its protection in return for loyalty and services rendered. Khalidi’s wife also worked as an English translator for the PLO’s press agency, Wafa. So savvy journalists knew that if they wanted the Fatah spin, they could get it from Khalidi. Hate crimes directed against a person's religion decreased in 2007, except against Jewish people according to the FBI's 2007 Hate Crimes Statistics reported in USA Today. In 2006, the FBI reported 1,597 hate crimes motivated by a religious bias. That figure dropped to 1,477 in 2007, according to the report. Of the religiously based hate crimes, attacks against Jews rose from 64% in 2006 to 68% in 2007. Anti-Muslim hate crimes, meanwhile, decreased from 12% in 2006 to 9% in 2007. Hate crimes against Catholics accounted for 4% of the reported hate crimes motivated by religious biases — down from 5% in 2006. Four percent of the hate crimes were motivated by anti-Protestant biases, and 9% were against other religions. Of the reported hate crimes motivated by religious bias, 18% occurred in churches, synagogues or temples; 26% occurred in or near residences or homes; and 12% occurred in schools or colleges. Watch syndicated columnist, Ben Shapiro's 3-part video (introduced first in its Preview) in which he presents concerns about the Obamania that is sweeping the nation. The program examines Obama's advisors, friends, running mate, and own words. Part I (sequentially follows trailer, or is selectable from 2nd Menu Button) covers the introduction and explores his advisors. Then view Parts II and III for his friends, running mate, public statements, and summary. Particularly important is Barack Obama's team's worrying ideology that America's War on Terror would be better served by handing the Islamists a hostile state in the midst of a bi-sected Israel; and the Obama-team's plan to reprioritize American policy to ally with Islamism - and against Jewish interests in preserving the safety of the Jewish refuge of Israel. Worthwhile viewing for anyone concerned about the reprioritizing of US policy away from assuring Israel's safety and towards emboldening global Islamism by increasing Iranian regional and global hegemony by attempting to appease the belligerent, Islamist States of Iran and Saudi Arabia, through Obama's team with those self-declared intentions. 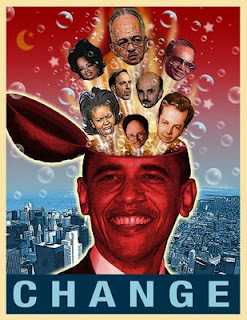 Journalist Ed Lasky of American Thinker has detailed many concerns about the anti-Israel character of Obama and his choices for his administration - (in January '08- even before he pulled Robert Malley and Samantha Powers from campaign visibility). Obama's soothing and inspiring oratory sometimes vanishes when he talks of the Middle East. Indeed, his off-the-cuff remarks have been uniformly taken by supporters of Israel as signs that the inner Obama does not truly support Israel despite what his canned speeches and essays may contain. Commentary Magazine writer Noah Pollak criticized Obama's appointment of Robert Malley and Samantha Power as foreign policy advisers. Pollak notes in a recent post that Power (a key and very public foreign adviser to Senator Obama) echoes the views of Zbigniew Brezenski in calling for "special interest groups" influence over foreign policy to be abolished. Power has also called for the elimination of foreign aid to Israel and its redirection to "Palestine", as well as the massive imposition of US military forces in the area to bring about and enforce a settlement (where, of course, they could find themselves easy targets and be subject to propaganda attacks as another imperial foray into the Middle East). Slate magazine writer Mickey Kaus has long wondered why Obama and his close relationship with Pastor Wright has all but escaped any media scrutiny and has pointed out that Wright's racial divisiveness is in sharp contrast to Obama's campaign mantra of unity. Many other very credible commentators have raised these issues and others. Yet critics of Lasky's articles have all but ignored the criticism arising from these quarters. Now why do we bring these people into the discussion? To show that there are serious questions that a wide variety of commentators, including a former Ambassador, have regarding Barack Obama and Israel. The redemption of the Hebrew children of Israel from the Exodus from slavery outside the Promised Land is brought to life in Disney's animated "Prince of Egypt." Touching, authentic-seeming excerpts from the Hebrew version of the film, translated into English (and transliterated Hebrew subtitles). "Deliver Us" ("Hoshia' na") shows the experience of Moses and the Jewish people's exile from Israel into slavery. The second song, "When You Believe" ("Eem Na'amin"), shows the experience of the Almighty returning the caretakers of His law and His land to their guardianship of the Promised Land. Translation credits are due a 22 year-old defender of the Holy Land and the Jewish peopleserving in Israel's Defense Forces, who donated this effort. Jackie Mason: "Sarah Silverman lacks the yichus to speak to or on behalf of Jews about voting"
The diary belonged to Ilan Ramon, Israel's first astronaut and one of seven crew members killed when Columbia disintegrated upon re-entering the atmosphere on Feb. 1, 2003. 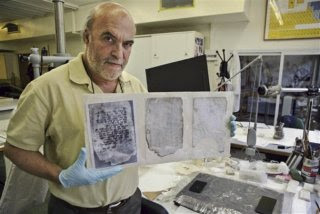 Part of the restored diary will be displayed at the Israel Museum beginning Sunday. Ilan Ramon holds a kiddush cup during a televised press conference from Space Shuttle Columbia. 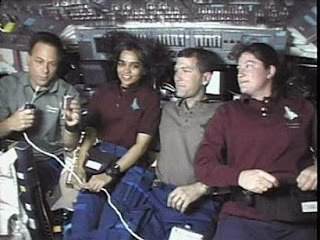 To his left, astronauts Calpana Chawla, Rick Husband and Laurel B. Clark (Reuters/NasaTV). Ilan Ramon set off for outer space on the Columbia space shuttle, armed with a picture of the Earth as seen from the moon drawn by a Jewish boy in Theresienstadt concentration camp, a torah scroll from Bergen Belsen, a microfiche copy of the bible, the national flag and the dreams and hopes of the State of Israel and the Jewish people. Ramon saved us this time not by clearing our skies of the threat of nuclear attack, but by reminding us of who we are and of what we can accomplish if we only have faith in ourselves. Ramon made clear at every opportunity that he went to outer space, not simply as a citizen of the State of Israel, but as a Jew. As the representative of the Jewish people he recited kiddush on Friday night. As a Jew he said Shema Yisrael as the space shuttle orbited over Jerusalem. As a Jew he insisted on eating only kosher food in outer space. And as a Jew he told the Prime Minister from his celestial perch, "I think it is very, very important to preserve our historical tradition, and I mean historical and religious traditions."